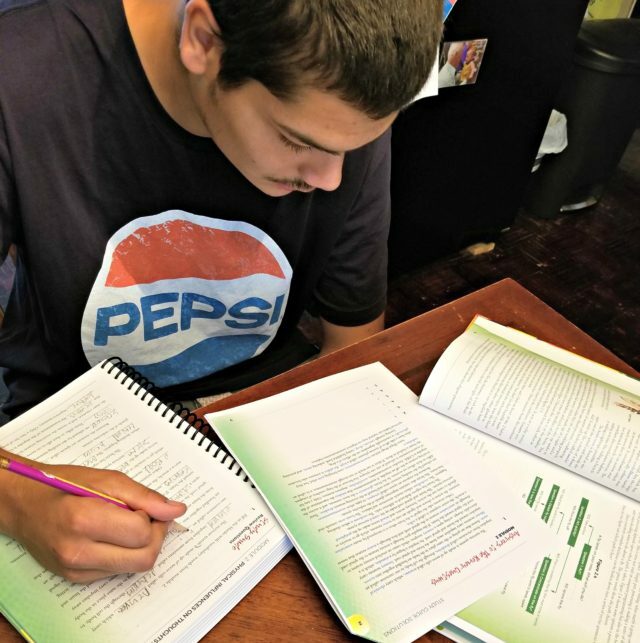 In our state, teaching health is a requirement for graduation. However, finding a health curriculum that is biblically based can be hard to find. 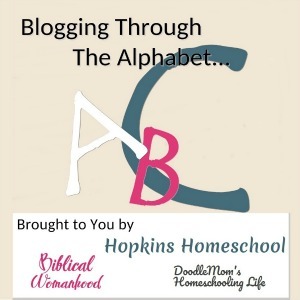 I want to make sure to teach the topics needed, but I want my children to see them as God’s creation. 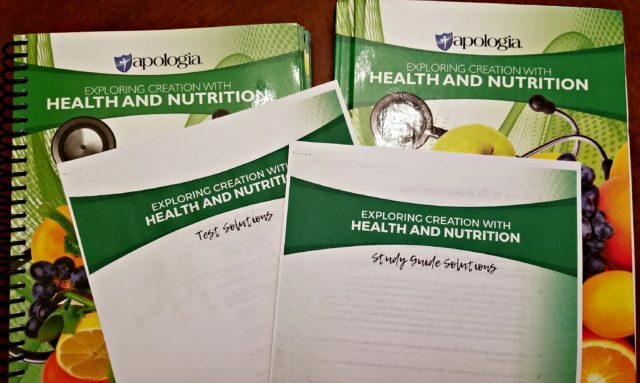 I was thrilled to see that Apologia Educational Ministries had recently come out with Exploring Creation with Health and Nutrition by Dr. Laura Chase for high school aged students. We had the chance to review the Basic Set. The basic set includes the hardcover textbook and one spiral-bound student notebook. Both of these are required to make the coursework. Also included with this set is access to the book extras on the website. 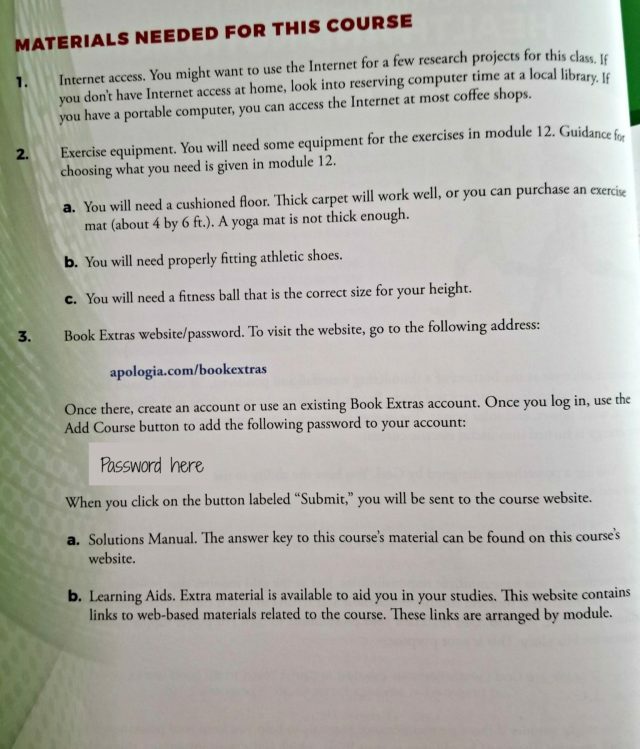 You will find the password for the book title in the front of your textbook. 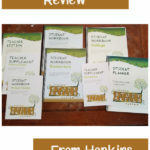 The book extras include the answers to the study guides and tests as well as many supplemental weblinks to visit to supplement each topic in the book. 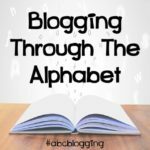 While these are not needed, it is fun to take a topic and explore it further. At the beginning of the Student Notebook, you are given a suggested daily schedule. This is set up for a whole year doing something three days a week. 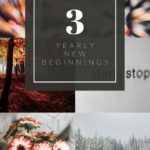 You can also make this into a one-semester course by doing something every day instead of three days a week. 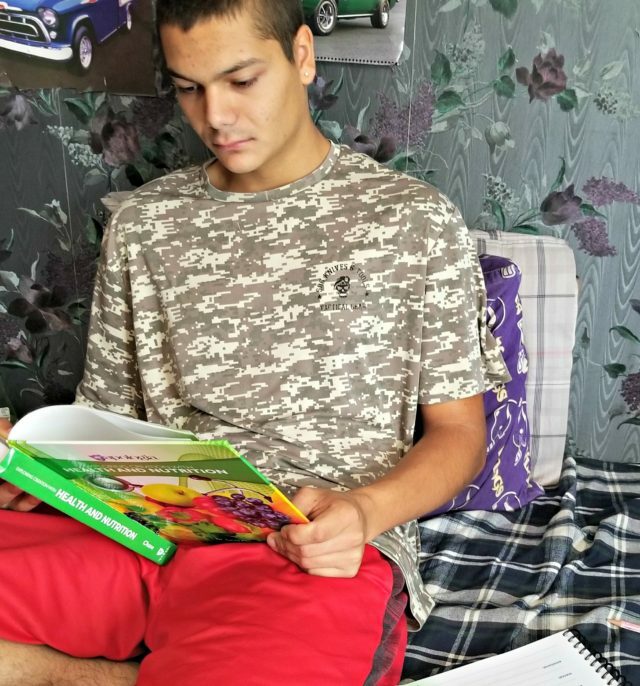 Moe Man has a full year to complete his senior courses. I figured that it would benefit him if we took the slower pace option over the faster. That means he has been working on this course on Monday, Wednesday, and Friday. We could pick any three days during the week, but this was the easiest way for us to split it up. Moe Man will read through the text, stopping as needed to work on the On Your Own (OYO) questions and projects. The projects don’t require much of anything. In the first module, Moe Man learned a lot about himself and his temperament. This is a huge thing for him! As we move forward, he will do things like checking on food storage to exercising daily. After the end of the module, there is a study guide to go over the main points in the module. This is a great way for the kids to study before the test. With the Study Guide Solutions from the book extras, Moe Man was able to go through and make sure he had the right answers to study from. 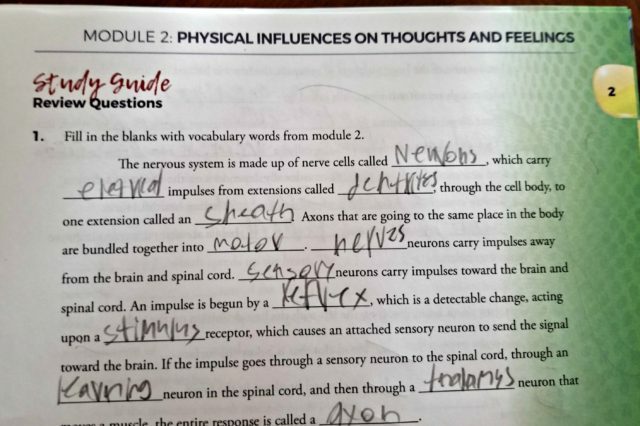 I let him correct these on his own so that he could get the right information in his head before the test. At the end of each module, there is a test to see what has been retained by the student. 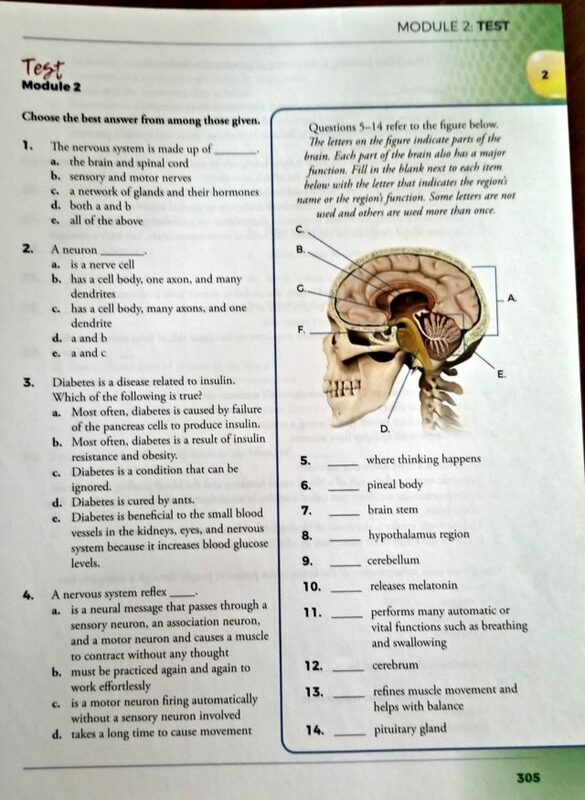 The questions are very similar to the study guide, so if your child actually studies the study guide, the test will be easy for them! I usually don’t like tests for Moe Man, he tends to get stressed out over them, but these are easy to do, and he has no issue. I have always loved Apologia in our house. They create great products, and they are based on God’s creation. When it comes to science, this is a huge factor for me and picking a curriculum. Moe Man has not used an Apologia product before but has always admired when the younger kids get them. He is thrilled that he has had the chance to use one finally. He loves the way the lessons are broken down. The OYO questions are easy to answer, but yet they challenge him to think a little more. The tests are easy enough for him to understand, being one who stresses over tests. He is actually doing very good at these tests. I really appreciate that the topics covered are all the topics that are needed for a high school health class, yet I don’t need to worry about proofreading the lessons to make sure they align with our beliefs. This makes me happy that Moe Man can work independently without me making changes on particular topics. 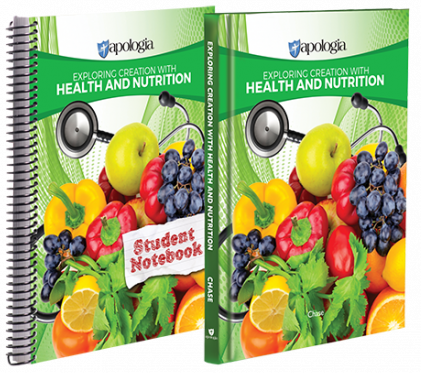 If you are looking for a health and nutrition curriculum for your high school students that has a strong biblical foundation, Exploring Creation with Health and Nutrition from Apologia is the curriculum that you want. 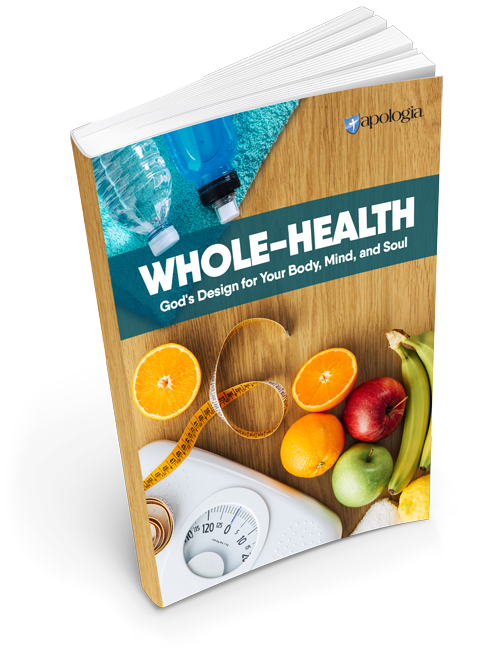 Right now, you have the opportunity to grab a free Whole Health Activity e-Book from Apologia. 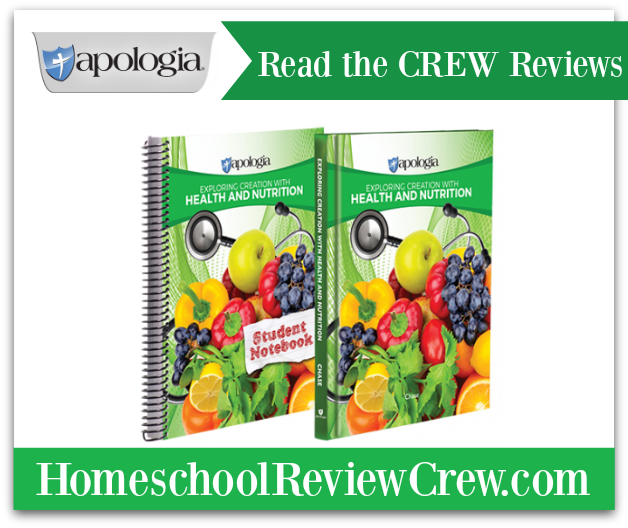 Included in this book is not only some fun activities and articles on health but also a sample chapter of Exploring Health and Nutrition to see how this wonderful curriculum would work in your house! 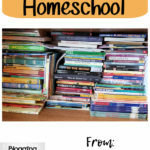 This sounds like an excellent resource.. One for me to keep in mind for my children.